This book is sure to leave you filled with hope for our species. Alex lives in Rockville Colorado. He is a precocious eleven year old, who is at least thirteen years when it come to responsible. He is the caretaker for his mother who 'has quiet days.' His much older brother lives in Los Angeles, but pays their bills for them. Alex is crazy about rockets and space. He's even built a rocket that he plans to send out into the universe. It will carry his golden ipod filled with information about his life, so that other life forms will know something about earth. This book is composed of these reflections. 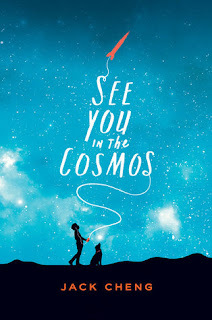 When Alex and his dog, Carl Sagan, head off to SHARF, a rocket festival near Albuquerque, New Mexico, he expects to be picked up at the train station by other people and carpool with them to the site. In spite of his train being 2 1/2 hours late, it all works out because someone he met on the train has a friend meeting him and they are on their way to the same festival. Alex is so open and friendly that he charms his way into many hearts at the event. Even though his rocket crashes almost before it is off the ground, he is able, with the help of one of the organizers, to look forward to building a better one next time. Through Ancestry, an online family history resource, he discovers that someone with the same name as his dead father lives in Las Vegas. He fantasizes that this is his father, not really dead, but suffering from amnesia, and gets it into his head to go and see him. From there he plans to visit his brother. His new friends are headed that way and he manages to catch a ride with them. By the time his journey is over, Alex ends up learning much more about his family than he could have imagined. As an adult, there were times when I was terrified for Alex. Thankfully he is lucky enough to connect up with basically kind people. Sometimes they make mistakes, but ultimately, it is their goodness that shines through. There is a deeply philosophical aspect to this novel that fills us with important lessons about life, family and friendship. It reminds us that world is filled with wonder if we open our hearts and minds to it.